Conaway Run Lake near Middlebourne. The 630-acre Conaway Run Lake Wildlife Management Area (WMA) consist primarily of hardwood forest and brush cover. Game traditionally taken in the management area include deer, grouse, squirrel, rabbit, and migratory game birds. 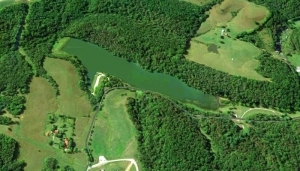 Conaway Run Lake, at 30 acres, is equipped with a small boat ramp and accommodates fishing for trout, bluegill, largemouth bass, and channel catfish. The lake is stocked with trout from February until May. Ten primitive campsites with vault toilets and well water and a 100-yard shooting range have been developed. Directions: Conoway Run Lake Wildlife Management Area is located in central Tyler County: 10 miles south of Middlebourne, WV. To reach the area from Middlebourne, follow highway WV-18 south for roughly nine miles, then turn right onto CR-48 and continue one mile. Further information on lodging, dining, and recreation near the Conaway Run Lake Wildlife Management Area may be found in our guide to travel in the Mid-Ohio Valley Region of western West Virginia, in which the management area is located. The eastern region of surrounding Tyler County lies within the Heartland Region of central West Virginia, within which additional travel information may be found.